Many Northerners are interested in learning how to care for Abutilon plants. These gardeners have been impressed by the beauty of the plants, but they have also been informed of the challenges that they face in trying to grow them. Being tender, they do not like cold weather, so they are more work to grow for Northerners than are the more cold-hardy plants. For those not put off by the prospects of this extra work, Abutilon plants are still well worth growing. You simply need to know how to care for them properly. That subject will be addressed below. But the first order of the day is finding out just what, exactly, Abutilon plants are. 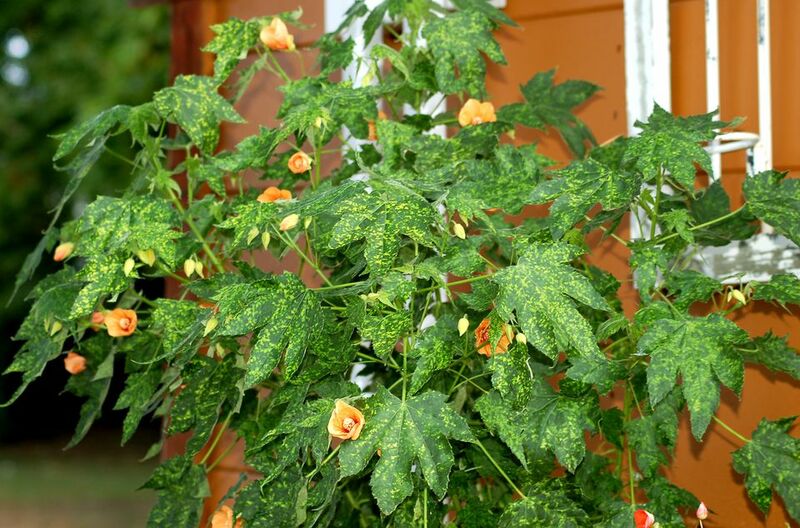 All About the "Flowering Maple"
Abutilon x hybridum is classified as a broadleaf evergreen shrub and can be grown outdoors year-round in USDA plant hardiness zones 9-10, where it may reach as high as 10 feet tall under optimal growing conditions. But in colder climates, the shrub will attain a height of only about a third of that. Some types have variegated foliage. This long-blooming plant bears flowers that are approximately 3 inches across. Depending on the cultivar that you grow (see below), the blooms come in a variety of colors (for example, red, salmon, pink, yellow, orange, white, or bicolored). Wintertime care (when the plants are indoors). Care for the plants during the rest of the year (when they are outdoors). Outdoors, grow the shrubs in full sun to partial shade. Northern gardeners may wish to grow these sub-tropical specimens in containers so that it is easier to bring them indoors in the fall, where they will be grown as houseplants during the winter. Grow them in a well-drained soil that has been enriched with compost. Abutilon plants have average water needs. In zones 9-10, optimal lighting is for the plants to receive full sun in the morning but some shade in the hot afternoon. Rather than performing outright pruning, the recommended way to keep the plants compact is to pinch the tips of the branches of the bushes while they are young. If you live in a cold climate, stay tuned to weather reports during the fall, so that you can be alerted as to when it is time for moving your specimen indoors for the winter. Your cue is when you hear about a frost advisory. While growing Abutilon as a houseplant during the winter, it will not need a lot of direct sunlight (just a few hours per day). Grow it in a relatively cool room in your house. You should also cut back on watering at this time, supplemented by occasional misting. While indoors, you may well experience pest problems with whitefly, spider mites, mealybugs, and scale; you can battle these insects by spraying Neem oil on your plant.